How to include custom locations for indexing in start menu search? I like to use new start menu search in windows vista/7. It is easy to launch application and documents by typing few characters. Is it possible to include more locations in start menu search. For example, many of my small utilities are located in D:\Utils. I would like them to appear in Start menu search. 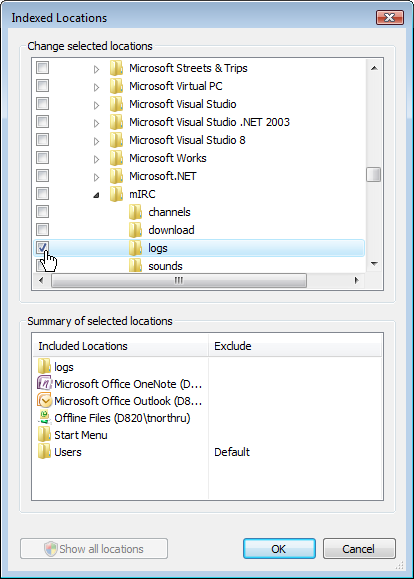 Note: I wouldn't like to move my utils folder in start menu folder just to make search working. Vistaclues.com has the solution for you! Windows Vista automatically index the places that matter most: all user profiles (including Documents, Pictures, Videos, Music, etc), your Start menu (so you can find applications by name), your e-mail (for Outlook, anyway), your notes (for OneNote), and any Offline Files you’ve configured. So, if you play by the rules and store everything in Documents, Pictures, or the other standard folders, you’re all set. If you’re a stubborn old coot who insists on storing your files at C:\MyFiles\ or something like that, well, it’s not being index. BTW, I’m a stubborn old coot. The Indexed Locations dialog appears. Click Show all locations, and then provide administrative credentials at the UAC prompt. 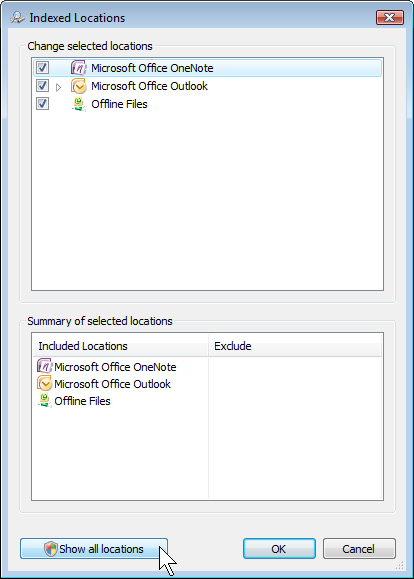 In the Change selected locations list, select the check box for the folder you want to add to the index. Don’t overdo it and select your whole C:\ drive–indexing will take too long, and you’ll get a lot of garbage results. Try to be as precise as possible. Click OK. If you’re indexing unusual file types (like log files), be sure to index that file type. Not the answer you're looking for? Browse other questions tagged windows-7 windows-vista search start-menu or ask your own question. How to include custom *network* locations for indexing in Start Menu search? How can I add a folder to the default quick-search list on the start menu on Windows 7? How to make the start menu find a program based on a custom keyword? Is it possible to have shortcuts appear in the start menu search through a symbolic link? Have start menu index applications in places other than program files? Windows 8 Start Menu - sometimes it's still got my last search populated?